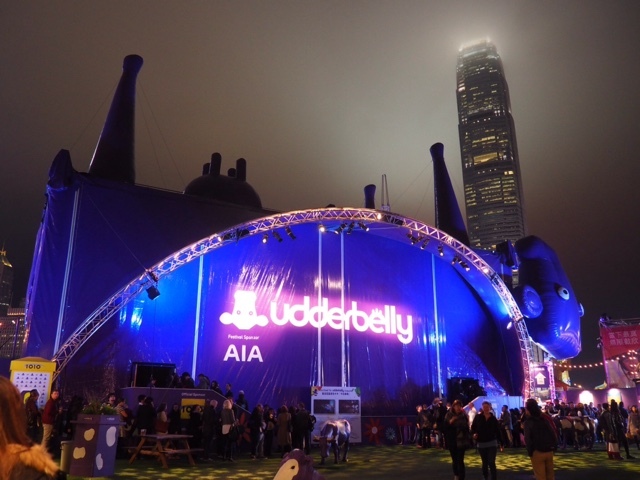 This is how I described seeing Russell Howard's show at the Udderbelly Festival taking place in Hong Kong at the moment. I was excited about the festival before I even knew he was performing, as Udderbelly has lots of shows at the Edinburgh Fringe Festival, and the purple cow takes up residence in my university for the month - a much better use of lecture halls, I'm sure many will agree. So for that same cow to visit Asia for the first time ever, while I'm living there, and coming to the same city? I couldn't believe my luck! Prices are a fair bit steeper than at the Fringe though, so I'm not going to that many shows. But Russell Howard was probably one of the first comedians that I really liked, and I've never seen him live before, so I figured what the hell, and parted ways with my cash. And he was most definitely worth it. Having only flown in recently, he was still very jet lagged, but his made it even funnier - I think everyone who is jet lagged acts a bit funny anyway, but a professional comedian is like a whole other level! And what was weirdly great, was that it seemed like he was improvising the whole set. The first jokes were all about what he'd seen in Hong Kong so far - I'm sure we all agreed that yes, it's a bloody weird place - and the flight here, so he was clearly telling those for the first time. The cow only holds a few hundred people too, so it meant that he could interact with the audience members a lot, which was more or less where the rest of the set came from, ad libbing based on comments from the crowd. While this did make it a somewhat scatter-brained show, as even he forget what story he'd been telling after a few digressions, it was even more impressive in many ways, since he was making it up on the spot. Once or twice I thought he was about to struggle, but he always saved it in time. It made it a much more unique show too, as he'll never replicate that with another crowd, and I expect even his other two nights in Hong Kong will be entirely different. I think one of my favourite moments was when he ran backstage to grab this funny wooden harp thing he'd found, and proceeded to strum away on it for a good while. And after running on 20 minutes late, not that I minded in the slightest, he finished, but then carried on chatting to the crowd, asking about things to do in Hong Kong - at which point one woman yelled out her address! Also, aside from the impressiveness of the ad libbing, the jokes themselves were utterly hilarious. Occasionally rude, occasionally a tad controversial, but unfailingly funny, and I was nearly crying at one point. I always found him extremely funny, but this might be the best I've seen of him yet. All in all, it was quite a weird evening, but I thoroughly enjoyed every second.